Based on Hans Christian Anderson’s the “Emperor’s New Clothes,” this charming modern musical adaption of the classic fairy tale is set in the land of Felicity which is blessed by people from all over the globe. Everyone is happy except for their Emperor, who can’t seem to get enough jewels and expensive attire. Some shifty weavers appear and lessons unfold. The play is appropriate for families and children over five years old. Bernice is delighted to add the title of Playwright to her repertoire of theater roles of more than 50 years. She remembers the moment she decided to write a modern version of the fairy tale, The Emperor’s New Clothes, with music. It was an evening her granddaughter Gabby , age 7, was sleeping over at Grandma’s house and Bernice read her the Hans Christian Andersen story. As she was reading it, she thought, “This story and it’s lessons are still relevant today.” She developed the concept of a wonderful storybook land called Felicity in which people from all over the world were welcome and their contributions were celebrated. New characters evolved that highlighted the kind and caring values of this magical kingdom. She is thrilled to see her dramatic concept come to life through this amazingly talented cast and crew that spans the ages from 9-to the 80’s! Bernice is Artistic Director of Center Players. Some of her favorite plays she has directed over the years at Center Playhouse include, Crossing Delancey, The Immigrant, The Heiress, Charlotte’s Web, Steel Magnolias, Arsenic And Old Lace, Driving Miss Daisy, I’m Not Rappaport, The Cemetery Club and A Doll’s House. One of Bernice’s proudest moments was when she received the prestigious Lifetime Achievement Award, this past September, at the NJACT Perry Awards Ceremony (New Jersey Association of Community Theaters). Bernice wants to thank her amazing husband, Bob, Co Producer and Editor of The Emperor’s New Duds. She is so grateful that her personal and professional partner is also her best friend. She looks forward to more amazing productions at Center Players where the community comes together to share their love of live theater and other performing arts and education programs. Enid is thrilled and honored to be co-directing this original musical with Bernice and working with Vic, who is the Musical Director. We make a great team! She is also the founder and teacher of Awakenings Theatre Workshoppe, which is a program for students of grades 4-7 sponsored by Manalapan Parks and Recreation. “I’d like to thank Bernice for this wonderful opportunity”. Congratulations to the cast and crew - thank you for your dedication and hard work! Vic Schioppo (who everyone calls “Uncle Vic”) is a nationally recognized singer/piano player for over 45 years. In addition to his vast cabaret experience, Vic has performed in, as well as, conducted orchestras in over 20 community theatre musical productions. Vic created and performed in his original musical revue The Queen Bees of Broadway which has been presented many times all over New Jersey, and was first performed at Center Players over nine years ago. Vic is happy to be ‘back home’ and part of this new exciting production. Ruth is playing the role of Kittyaura in the Emperor’s New Duds. She made her theatrical debut recently, as Karen, in Dinner With Friends. She was encouraged by her late husband to “reach for the stars” . Ruth is fulfilling a lifetime dream by acting on stage, and is thankful for the opportunity to join the theatrical group at Centers Players. Ruth’s interest in theater peaked during her teens, when she secured several lead roles in school and college plays. 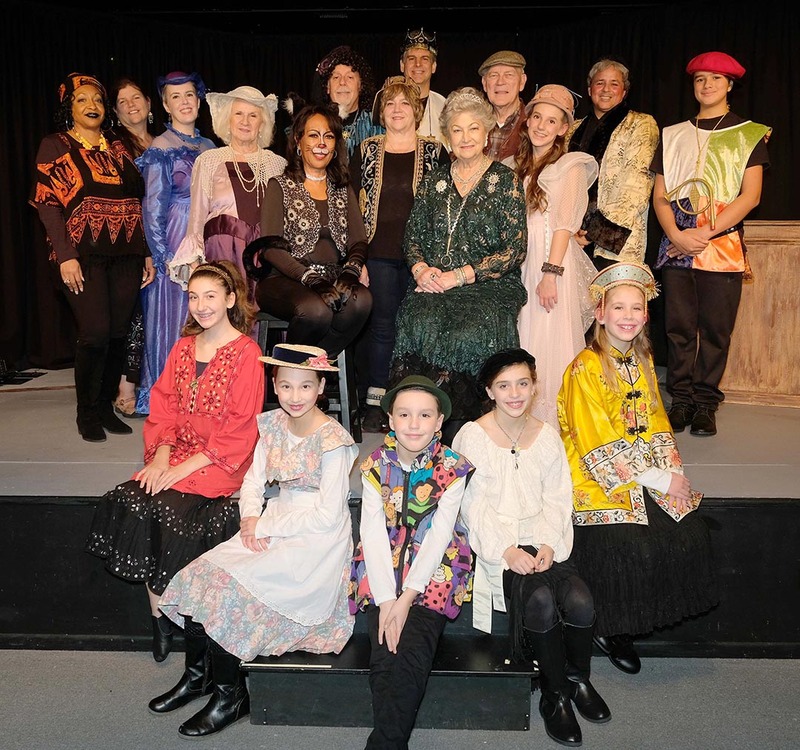 After 37 years of working as an Administrative Director, working under five New York City Mayors, Ruth retired in 2015....Her earlier career as a teacher focused on teaching children life lessons through drama. A graduate of The City University of New York and Richmond College, Ruth earned a Master’s degree in Public Administration and a Bachelorette in Psychology/Education. Jordan is 12 years old and making his stage acting debut in this show. Jordan has performed in talent shows at his school, and has won several awards. He has studied Improv at the George Street Playhouse in New Brunswick NJ. Jordan is also a member of the theater program at Eisenhower Middle School, in Freehold Twp NJ. Harold made his acting debut in the production One Flew Over the Cuckoo’s Nest here at Center Players. He then appeared as Prime Minister Mapway in the dramatic reading of The Emperor’s New Duds at Oakley Farm, and most recently in The Ghost Train. Having retired from the practice of Oral surgery, he is most grateful for these new opportunities and challenges. 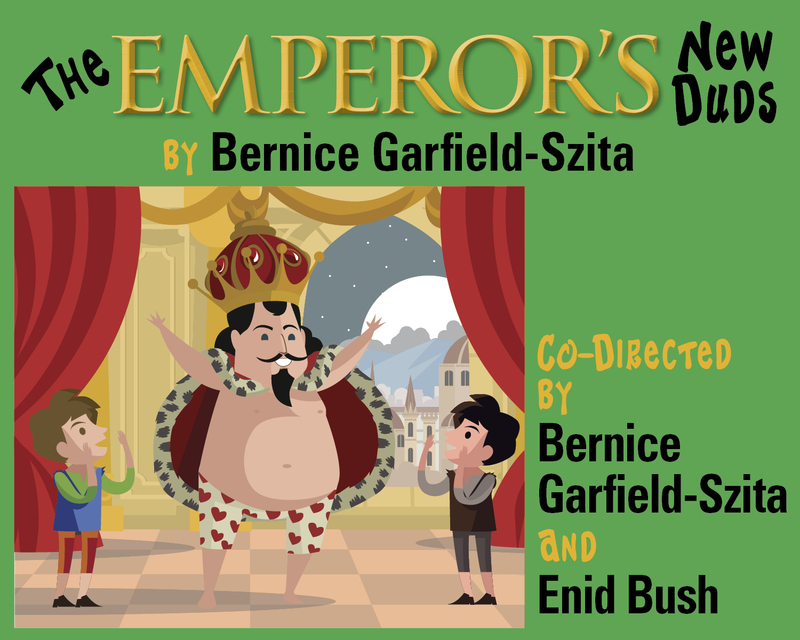 Thank you to Director Bernice Garfield-Szita for the opportunity to reprise the character Mapway in this musical adaptation of The Emperor’s New Duds. Special thanks to my family for their love, encouragement, and enthusiasm. It always helps. Israel - AKA Izzy Martin......is making his acting debut here at Center Players. Izzy has been a professional entertainer for over 20 years. He has had past recording contracts with several major record labels. Izzy has performed in various musical acts all over the United States. He is an accomplished musician and vocalist and plans on continuing to perform on live stage. Marina is thrilled to be joining Center Players for this production. She has been on hiatus from performing for the past 20 years, spending time raising her children, training her dogs and teaching Montessori preschool and kindergarten. She is an avid storyteller and recently has performed at Belmar Arts Center’s annual Tellebration. She has performed with On The Spot Improv Troupe in Bloomfield, NJ and Comedy Dogs Improv Troupe in Atlanta, GA. While in Atlanta she also attended several acting classes and participated in local theater. Ramona is proud to be making her third appearance at Center Players. She made her acting debut on Center Players stage in, Mostly True Things, Story Telling Show. She has also appeared in the dramatic reading of The Emperor’s New Duds at Oakley Farms (Lady Bountiful). She is a philanthropist and volunteer for the Freehold Community. She helped organize an overnight program for the homeless. She works as an interpreter to the Spanish community at Centra State hospital with the gestational diabetes unit. She has recently become a chaplain and serves at Centra State Hospital in that role. As a young woman, Ramona sang soprano in her local church and her passion for song and theatre has been a lifetime dream and she is now able to live that with the Center Players! Barbara is a Freehold Township Committeewoman, and has served as Mayor in 2013 and 2016. Prior to being elected to this position, she was Director of the Monmouth County Board of Chosen Freeholders and a Councilwoman in Freehold Borough. She retired as principal of Howell High School, which is home to the Fine and Performing Arts Specialized Learning Center, in 2003. A graduate of Monmouth (College) University, she returned to her Alma Mater to serve as Public Servant in Residence, and she received an Honorary Degree in Letters from Brookdale Community College. She is also past president of the Legal Aid Society of Monmouth County. She was named one of ”40 Who Make a Difference in Monmouth and Ocean Counties” by Gannett News, “A Woman of Distinction” by the Girls Scouts of the Jersey Shore, and a ”Woman as Agent of Change” by the AAUW. No stranger to the stage, she performed in high school and college plays as well as doing a season in summer stock (once was enough) and with the Center Players in Charlotte’s Web and Mostly True Things,Story Telling Show. She also appeared on The Late Show with David Letterman. She dedicates her performance as the Empress Antigua to her husband, Patrick, who has always been her biggest fan and her most loyal subject. Tom is happy to once again perform in The Emperor’s New Duds after being in the summer performance, and is especially pleased to have been “promoted” to Emperor. Thank you, Bernice, for dragging me back into this show (okay, not dragging, but asking). It’s always a pleasure to be back on stage with Center Players. Break a leg and God bless you, my fellow cast and crew! Kylie is an 8th grader at Eisenhower Middle School. This is her second Center Players Production, and she is thrilled to be back! Some favorite past shows include Mulan Jr.(Mulan), Snow White (Magic Mirror), Seussical (Who), Oliver (Charley Bates), and Shrek the Musical (Young Fiona). Kylie keeps busy with vocal, piano, ukulele, and acting lessons. She participates in Tri-M National Music Honor Society, NJ Thespian Troupe, chorus, drama, church choir, handbells, and is lead singer of the band “One Step Forward.” Kylie would like to thank Bernice, Enid,Vic, and the talented cast and crew of The Emperor’s New Duds for making this show such a fun experience! She also thanks her family for their love and support. Geri is loving her role as Slydon, the magic weaver .She has been acting since 2013 and has been in several shows including; The Boys Next Door, Doodle: The All American Sing-A-Long, Company and The Choir Room. Her favorite type of show has been the Improv Dinner theater Productions; Witches Brew and Hillbilly Wedding Massacre. She has performed with Center Players before, but this is her first opportunity to work with Bernice as director. Both director and cast bring this old story into a new era. Debra is making her theatrical debut at Center Players. As a young child Debra’s desire was to become a famous actress one day however, life’s journey led Debra into the educational arena because of her passion for helping young people. Debra loves to help youth discover their hidden academic talents, and she knows all too well; Education transforms lives and gives youngster’s a clearer view of their place in the world. Debra received her master’s degree in Urban Affairs from CUNY - Queens College, and for the last 27 years, Debra has served as the Program Director for the New York State Department of Education. She has received several citations from the New York City Council, and numerous plaques from students, applauding her for her wonderful leadership! Debra has a son, and resides in Matawan, NJ with her husband. Debra thanks Bernice for giving her the opportunity to explore the arena of theater and enjoys working with this phenomenal cast and crew. Patrick, who is making his theatrical debut as Citizen 1, in The Emperor’s New Duds, is a local attorney. He has completed more than 300 jury trials, so he is now stranger to public speaking. While attending Monmouth College, now University, he was a member of the school’s first varsity debate team which won the New Jersey Collegiate Championship. While at the University of Santa Clara School of Law, Patrick was chairman of the Honors Moot Court Board. He is a member of Pi Kappa Delta, the National Honor Fraternity in Speech as well as a member of Psi Chi, the National Honor Fraternity in Psychology. Patrick is a member of the New Jersey and Monmouth County Bar Associations. He is past president of both the Legal Aid Society of Monmouth County and the Friendly Sons of St. Patrick of the Jersey Shore. He was the lawyer/coach of Howell High School’s Mock Trial Team that won the Monmouth County championship. He is a former Freehold Borough councilman and was the Borough’s first prosecutor. Patrick dedicates his performance to his wife, Barbara, who roped him into doing this show. I am a fifth grader at Lafayette Mills Elementary school in Manalapan, New Jersey. I am a member of the chorus and play the trombone in the band at my school. I have been a member of the Awakenings Theatre Workshop for two years. I have also participated in the St. George Theatre Christmas Show. I am excited to be performing with Center Players Inc.
Caitlyn is making her debut performance here at Center Players. She is an eleven year old, 6th grade student, at Pine Brook School in Manalapan. She is a cadet Girl Scout with Troop #1008, and a Bronze Award recipient, 2018. Her loves are theater, art, gymnastics and her family. She is very excited to be appearing in this performance at Center Players. Hi, My name is Annarose Surette. I am 10 years old and I go to Lafayette Mills Elementary School. I’m currently in the fifth grade. In my spare time I enjoy acting, chorus and piano. For the past two years I have been involved in the Awakenings Theater Workshop. I also played Ursula and Atina in The Little Meermaid at Country Roads Day Camp. Cole is a 4th grader at Applegate Elementary School. This is his first show ever! After years of watching his sister perform, he decided he was ready to give it a try. Cole is involved in chorus, church choir, guitar lessons, and plays bass guitar in the band “Lightning and Thunder.” Cole also loves sports! He plays baseball and basketball. Cole is so excited to be a part of this show and thanks everyone at Center Players for giving him a shot! Rebecca is very excited to be part of the cast of Emperor’s New Duds. This is her second performance at Center Players. She hopes to have the privilege to continue to appear in future shows here. She has been in many other musicals such as Shrek Jr. (Teenage Fiona), The Little Mermaid Jr. (Arista), and Once Upon a Leprechaun (Fairy). She hopes you enjoy the show! I have been involved with theatre all my life. My role as an Adult Citizen here at Center Players, marks the first time I have been onstage since high school! While living in Utah, I began making costumes for anime (Japanese Cartoon Movies)conventions and Science Fiction Conventions. I made costumes and props for many community theatre productions including Macbeth, A Mid Summer Nights Dream, Peter Pan, and The Three Musketeers. I am so grateful for this opportunity to work with costumes in my first New Jersey production.